Our 2019 diakonia retreat is open to all past and present diakonia students, instructors, and friends. The retreat this year will be held on Saturday, March 23 at Mt. Hope Lutheran Church in West Allis, 8:30-3:00pm. Our topic will be “Faithful Innovations: Blurring the Lines Between Church and Community” and our leader will be Pastor Matthew Short from our own synod office. This retreat will give us the opportunity to re-think where the church and community intersect, and how the changing structure of our churches and society will shift how we are “church” and how we “do church”. Some of the topics that will be explored: God inside; God outside? Membership; Discipleship? Working For; Being With? The day will challenge the way you think about church. “It’s not just about church. It’s about life. 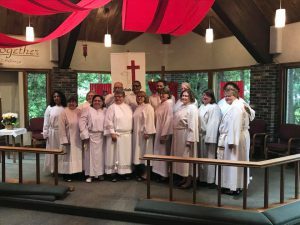 Diakonia is a lay education program in the Greater Milwaukee Synod and other synods around the ELCA that provides a spiritual journey to those who wish to understand more fully their call to minister in their daily lives. Diakonia meets once each week for two years during the school year. Classes cover such topics as the Bible, Christian Doctrine, Christian Ethics, Church and Society, and others. Together, students and teachers will discover the richness and depth of God’s word as revealed through these different disciplines. Click on the links below to read more about the program.